Well isn't this refreshing? 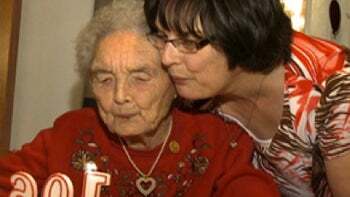 Rather than lecturing us on the benefits of eating vegetables and doing vigorous workouts, Margaret Ellen Moores of Newfoundland says she's reached the age of 106 thanks to eating junk food and enjoying herself. Her daughter said at her birthday party this weekend, "She loves her sweets. She never drank water in her life ... [She loves] her salt beef, the same old-time meals as ever she had … She loves her pizza and French fries now. So it's not her diet is it?" When asked about the secret to her longevity, Moores said, "Good times I guess, when I got old. I didn't have them when I was young ... [I] got so fond of them, I couldn't let them go."